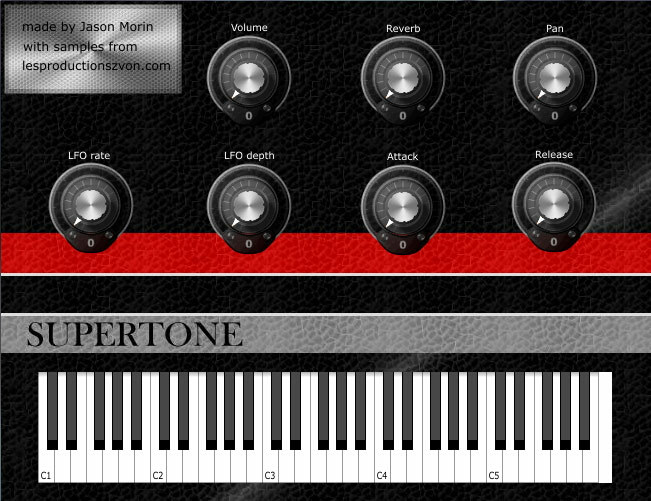 Free VSTi made by Jason Morin with the Maize Sampler.Contains samples from the Supertone reed organ that is part of my Reed Organs sample set. I recorded it with 2 different microphones including a shotgun mic, the samples in the VSTi are those recorded with the regular mic. There are less samples than in the sample set. In the sample set, each of the 25 keys (from C3 to C5) was sampled and included. In the plug-in, 5 samples are used mapped to roughly 5 keys each. Even with less samples it is very playable and enjoyable. The fan noise and powering up samples are also not included. 4 different Reed Chord Organs: Bontempi B3, Magnus 360, MicrOrgan and Supertone. The last 2 are rare models. Available in Kontakt 3.5, Kontakt 4 and sfz formats. Kontakt versions have 72 instruments and multis made with the original samples and 26 instruments using the tone or time machine engines, custom skins and scripts (2 scripts for K4 and 1 for K3.5). Also the Kontakt versions include instruments with original tuning of the instruments and retuned instruments. The sfz version has 27 definition files. These organs are very noisy with their fan. All the notes have been carefully denoised to limit the noise while keeping the original sound but I have sampled the noise and you can put it back if you desire to. The chords have not been denoised. I bought all these organs at a local flea market and all had seen better days. But that’s part of their charm!